Neuron inherits all theming courtesy of the Masque addon. Neuron has full Masque compatibility, and the theming options found in Masque are quite in-depth, not to mention the robust portfolio of skins made to support Masque. In short, you can make your bars look any way you like! Neuron features an unlimited number of macros. You can create as many bars/buttons as you want/need per character! Are you a clicker extraordinaire? As many buttons on the screen you want where you want, when you want! Macros the size of Texas! Up to 1024 characters in length! Maul's unique mouse-over key-binding system - where the mouse-over binding system was born! 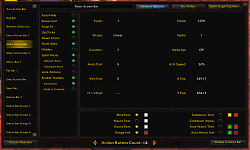 Many other of the favorite desired bar addon features and then some! And, last but not least, MASQUE support! Neuron contains a graphical bar editor that allows for nearly endless customization to bar shape, size, orientation, and much more! Further, Neuron has neither the limitations on max number of bars nor on the max number of buttons per bar, as you might find in addons such as Bartender4 or Dominoes. If the command line is your thing, all of the options found in the graphical bar editor can also be set using the below command structure. scale: Scale a bar to the desired size. 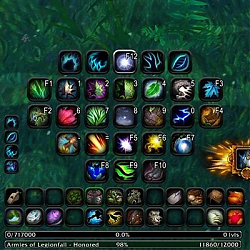 Neuron is a fork of the amazing Ion Action Bars addon started by Connor Chenoweth aka Maul, for World of Warcraft Legion and onwards. All credit for the bulk of this addon should go to him accordingly, along with SLOKnightFall for his maintainership throughout the years. I, Soyier, take no credit for the idea or implementation of this addon prior to my adoption of the code in the Fall quarter of 2017. I like IntelliJ, right up to the point they want me to pony up some cash to develop PHP. I'll use it for trying to learn lua though. And weirdly enough I'm this close (pinches fingers together) to using VSCode for editing PHP. That or Sublime. Just need to figure out how to change my syntax highlighting and figure out how well regular expressions are supported. Oh, yeah it seems PhP is locked behind the Ultimate edition paywall. I just use the Community Edition, and the EmmyLUA plugin is free and open source so I've never had to worry about it lol. Last edited by Soyier : 04-19-19 at 02:58 PM. I can hopefully start C++ tutorials soon and lua is something I want to combine with it. Working on the addon would give me some practical application for the learning process. I've downloaded IntelliJ IDEA in a zip package. Version info included below. I have this "thing" about only using portable apps and then often only if they are cross platform and opensource. I have been using Notepad++ and really like it for my web development. I was planning on using Codeblocks for C++. I guess I'll see what IntelliJ has to offer. If I could use one IDE for pretty much everything I would prefer to do that. I had thought about using Eclipse but there is just something I don't like about Eclipse. Perhaps I should just spend more time with it. I also have VSCode but don't trust anything Bill has touched any further than I could throw his ego so really have only touched it twice. So I'm going to start on C++ by watching and using the videos from TheChernoProject. If you have any other recommendations on beginner tutorials for C++ please let me know. IntelliJ is my favorite IDE by far, and I've used many. Eclipse was nice, but IntelliJ surpasses it in almost every way. Last edited by Apollumi : 04-19-19 at 01:26 AM. Ok so Buju already got us started but here is a basic 2min lesson on addons haha. The LUA code is read into memory while the game is loading the character in, and it's at this time that the entire addon is read from top to bottom. What I mean by this is the LUA engine begins reading code starting with the 1st .lua or .xml file in the Neuron.toc file, and goes down the list in the .toc file until the very end. Also, it isn't simply reading the code into memory for later, this is the literal moment that the code is run (which seems counter intuitive but it actually makes sense). Thus if I had an addon that counted from 1->1000 and printed the numbers to the chat window, this would happen at the exact moment it's read the first time, and the user would see the full list of numbers in the chat box right when the world finishes loading. So in essence, the program is run in its entirety before the character is even on the screen. Now, to answer your other questions, or to pre-empt your question of "if the addon is run in its entirety before the game is even loaded, how does the addon work in real-time?" And the answer to this is 1) Frames and 2) Events. Frames: Frames are the base UI elements of the game. A frame is anything that is visible on the screen, and Frames can have parent frames, and can be nested in one another etc. I.e. We have a Bar frame, with a bunch of Nested Button frames, and so on. The frames themselves have a number of properties belonging to them, and a number of scripts and events that you can "hook" onto to do work. I.e. a button has an OnClick event, and I can hook a function of mine to do something when this event happens. This function is 'hooked' to the OnClick event of this particular button during the pre-loading stage when all the LUA code is being read in initially. And this code is now bound to the button frame itself, and will be executed each and every time this button event happens so as long as the button exists or we choose to unhook this event. You can see all the frames in game by using the "/framestack" command in game. Events: The game as far as an addon is concerned is a series of sequential events that are being fired all the time. If you use "/eventtrace" in game you can see all the events happening. Now, events are important because they're the only clue to the UI as to what is going on. So events fire when combat starts, combat ends, a spell is cast, channeling starts, etc. Now, the big trick to creating an addon like Neuron is registering the Neuron scripts to specific events in the game. The castbar for example is registered to the UNIT_SPELLCAST_CHANNEL_START function, so when this particular event fires, the castbar knows to spin up a series of functions that will lead to the castbar becoming visible and showing the cast happening. There are thousands of different events in the game, and they are a nightmare and a gift at times. Finding the correct events to register our scripts and frames onto is a pain in the arse, but it works surprisingly painlessly most of the time. Further, events come in two varieties, game events like "PLAYER_ENTERING_WORLD" that give you status updates on what is happening in the game itself, and object script psuedo-events like "OnMouseclick" or "OnHide" or "OnEnter", which are all functions inherent to frames that can be hooked and leveraged for our purposes. By default a button does nothing when clicked, it's only when we hook this function call and attach our own function that clicking the button actually does something. So, in summary: The code that you see in the .lua files is very boring and just consists of creating a series of frame objects, setting up a bunch of functions and hooking them to specific events, and registering our frames to in game events. Once this happens, the code that exists and is running in the game is only the stuff that is tied to the frames and events (and any secondary functions that our called by the hooked/registered functions). At runtime during the game, everything that happens in response to player or game input is whatever we front-loaded onto those frames and events ahead of time. Last edited by Soyier : 04-18-19 at 09:14 PM. I think they have addons run on another thread now so it doesn't take time away from rendering each frame of the game? Don't know, just guessing. Still I am thinking that the game engine must allow time each frame for each of the addons code to look in the buffer for keyboard input and events, etc...? So they can still impact performance but not as much? 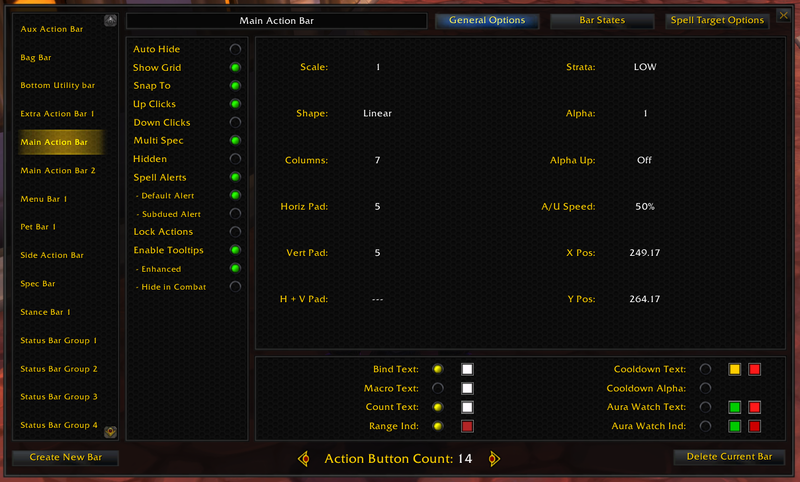 They run on the same thread, but the WoW UI engine gives each function a time limit for execution. If the function doesn't return in time, the WoW engine breaks out and throws a Lua error. Responsibly-programmed addons run heavy functions as coroutines, which are not the same as separate threads. Coroutines are functions that run for a self-defined length of time, then yield to the next coroutine until it's their turn again, then continue where they left off. Last edited by BujuArena : 04-17-19 at 10:32 PM. WoW runs the Lua JIT compiler (just-in-time compiler) when loading the game initially (with the loading screen) and on reloading UI (when running ReloadUI()). This compiles your addons to machine code, which then runs much faster, so it doesn't have to parse the scripts each frame. It parses them once when initially loading, and never while you're playing. After the scripts are compiled to machine code, yes, the addons' now-compiled machine code runs each frame while you play. This is why a more powerful CPU core is better for running lots of addons. Yes, this will make me look stupid. And I am coding stupid currently. But I have some questions for you about lua. What I am wondering is does a lua "addon" stay resident in memory like a program and doesn't exit. My lack of understanding comes from the fact I have only done scripting where the code is parsed until the end and then the variables are gone until the script is parsed again. Server side (host side) variables aside that is. How does an addon stay present on the screen while the program code executes redrawing the scene over and over? Is it because the program code (wow in this case) is rendering the addon for each frame also? I guess I'm asking is the neuron code rerun for each frame of the game. And by doing this it is checking key presses, events, and modes for every single frame. I would think parsing a bunch of addon scripts each and every frame would slow you down far more than it does. So in my mind either it stays resident in memory or the lua engine is incredibly fast. You could possible regret throwing out there that you like to pass on knowledge about coding. Heh. Last edited by BujuArena : 04-17-19 at 08:30 PM. I think the hardest aspect of learning anything is learning what it "means". Where is it's place and how is it realistically (not idealistic) used. It is hard to teach what something means, for lack of a better word. A subject has to have clear boundaries to focus people otherwise they can assume all sorts of meaningless things. People deeply versed in something can often make bad teachers because they know what something means in a more or less instinctive way and often lack the ability to express it. Last edited by Apollumi : 04-17-19 at 08:25 PM. Btw, I would still like to help you with the addon. My progress is slow however. I finished studying PHP (giggle) and have mostly solidified writing functions and classes in PHP. Getting comfortable with OOP. Next I want to start to tackle C++. I eyed lua programing again last night. Found some tutorials. I want to learn lua because based on what I have read it could be very useful for quickly extending what I could do in C++ and lua is a fast scripting language. Last time I looked at your lua code however I could see it better but still lost though. Last night I downloaded the latest version to try out hoping it would resolve my problems. No joy. What I have done (repeatedly, different releases) in an attempt to fix the problem is delete my neuron.lua and neuron.lua.bak files and delete Neuron from interface addons. Then I put the new neuron files into the interface addons directory and attempt to start from scratch. It seems like everything is reset. But when I try to set alpha up for mouse over or combat + mouse over it does not work. No alpha change at all. I could be doing something wrong and don't mind doing whatever to fix it. Jut hoping for some suggestions before the version that has continued to work for me gets too old to use. It's a bug. I'll get it fixed, sorry I'm being stretched in a thousand different directions these days. Give me a bit and I'll see if I can replicate and solve it. The reason I don't use the same bar for both abilities and O/P/V states is because I play in a very weird keybinding setup due to being left-handed. I've tried to adapt to a more regular configuration, even I've tried the typical right-handed stup, but I just can't. My main attacks are keybound to YUIOP, which are the keybinds I want to use when I'm in override/possess/vehicle. If I use my regular action bar for that porpuse, the OPV abilities arrange at the start of the bar, which are bound to 890BG keybinds (I know it doesn't make sense but it is super logical for me). Also becuase the OPV states usually have 5 buttons, it would look very weird to a 18 slots bar with only 5 of them showing something. And as you can see in the pictures, it would look better the way I want to do. Back at the start of BfA I had set it up like this and it worked fantastically. Now for some reason you can make it work but I can't. Thanks for your patience by the way and sorry to bother with this little inconvenience. I gave this a try as well and can confirm the behaviour, with OPV states set and only OPV visibility toggles enabled the bar isn't showing up in normal use when OPV is active and it seems that the bar will only show when all visibility toggles are enabled. I thought after relogging that relogging might have fixed it but it was temporary, I disabled all but OPV visibility toggles again and the bar remained while I was in the OPV zone and disappeared when I left the zone, but it didn't come back when I re-entered the OPV zone. Sure, how do I open a ticket? I'd really like to help fixing it. Thank you for considering a donation! Developing World of Warcraft Add-ons is hard work, and it is made possible though donations by everyday people such as yourself. Cheers!